I'm a bit ashamed to say this, but until I visited Istanbul, the closest I had been to being inside a mosque was watching "Little Mosque on the Prairie" on CBC. This situation has now been remedied. As I've noted in other blog posts, old Istanbul has a lot of mosques, from tiny neighbourhood ones with a two-story minaret to huge skyline-dominating memorials to sultans and princes. Most of the large-scale mosques in old Istanbul are loosely inspired by the general design of Hagia Sophia, and after I had seen and been blown away by that building, I was eager to see how the Ottomans used and updated the same architectural patterns. First up after Hagia Sophia (although I waited a day to recover) was the Sultan Ahmet mosque, otherwise known as the Blue Mosque. It is separated from Hagia Sophia by a nice park with fountains (and, on the weekends, lots of families and young couples hanging out on the grass). It's a massive palatial structure, with crowds of worshippers and tourists passing through it all day long. After Hagia Sophia, the Blue Mosque is luscious and pristine, with its dense, beautiful tile work and its plush carpets - it is also more than a thousand years younger. You have to take your shoes off before you enter the main space of the mosque - all the people removing their shoes at the entrance reminds me a bit of house parties in Canada. I noticed many of the locals wear easily-removable slipper-style shoes. I recommend laceless Blundstone boots if you're going to spend a lot of time looking at mosques - avoid the 40-eye monster Doc Martens! When you get inside, you can see why everyone removes their shoes: all of the activity in a mosque happens directly on the floor, on top of beautiful thick plush carpets. The ceilings are very high, but wide chandeliers are suspended at about 8 feet off the ground, a perfect height if you're on your knees, but the mix of very low and very high is a bit strange if you're standing. 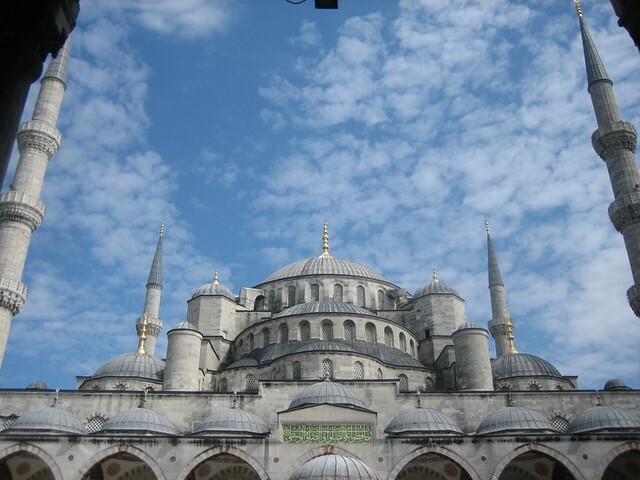 The Blue Mosque is often very crowded and one can feel rushed while in there. The other big mosques in the city are less busy. The other very major mosque in old Istanbul is the Sulimaniye mosque, looming from a hilltop over the Galata bridge - it's undergoing extensive renovation and is not currently open to visitors (they had a cute backup mosque in a tent outside, complete with mimbar, mihrab, and a lush red carpet). The only smaller mosque I went into was The Kalenderhane Mosque, which was converted from a 12th century Byzantine Orthodox church. 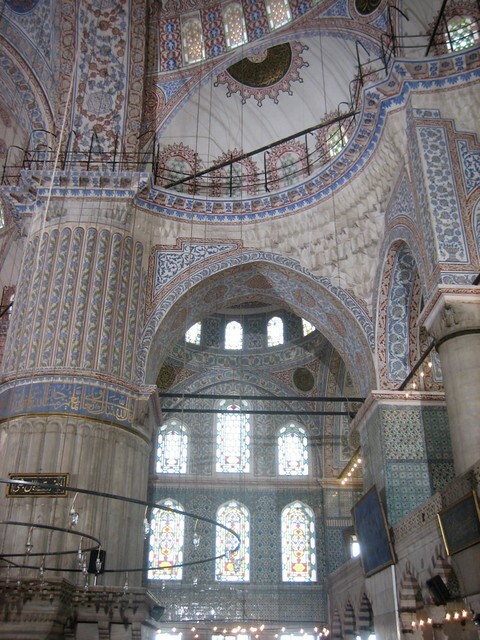 Inside, it looks like a miniature of Hagia Sophia, with similar marble and stonework. It's locked, but a man sitting outside will let you in and give you a tour in exchange for a donation. A warning to female travellers, though: we found the guide on the day we visited to have a very inappropriate sense of my partner's personal space. My favourite mosque from my visit was the Şehzade Mosque, up near the bazaar district. When I first discovered the Sehzade Mosque, I had become a bit lost, and had it confused with another mosque which one guidebook had dismissed as recent and inconsequential, and another didn't mention at all - I thought this was unfair, since it seemed beautiful and majestic to me, and obviously had a lot of care given to it. I went back a few days later, keeping better track of where I was, and I was very happy to discover that I had been mistaken: that it is quite a famous building, commissioned by Suleiman the Magnificent himself to commemorate his favourite son's untimely death, and designed by the Ottoman Empire's greatest architect, Mimar Sinan. Being a bit off the tourist track, it doesn't suffer from hordes of tourists and is often empty, or only has a few people dotting its massive interior. It has very pleasant park-like grounds (often with children and kittens playing in the grass), and very pleasing architecture, including two intricately decorated minarets. 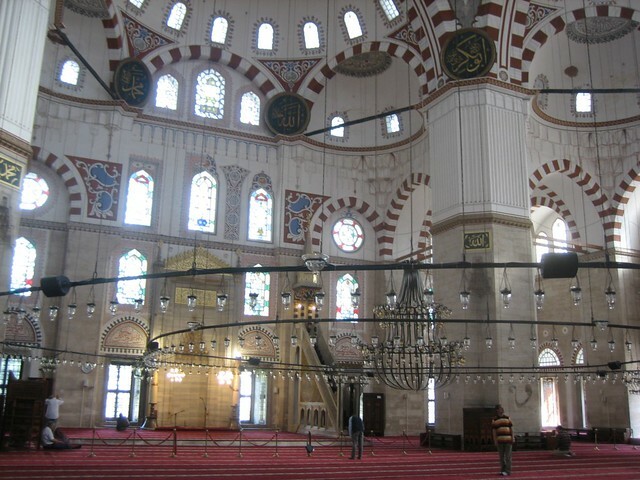 Sinan designed it to maximize the interior space without requiring lots of supporting interior columns. The interior tile work is beautiful, but leaves a lot of white space, for a cleaner, more elegant look. It is in pristine condition - it is hard to imagine that this building is almost 500 years old. After the heat and chaos and sheer visual overload of the streets of Istanbul, time spent in this elegant holy place, with its cool white tiles and large empty spaces, is deeply refreshing.